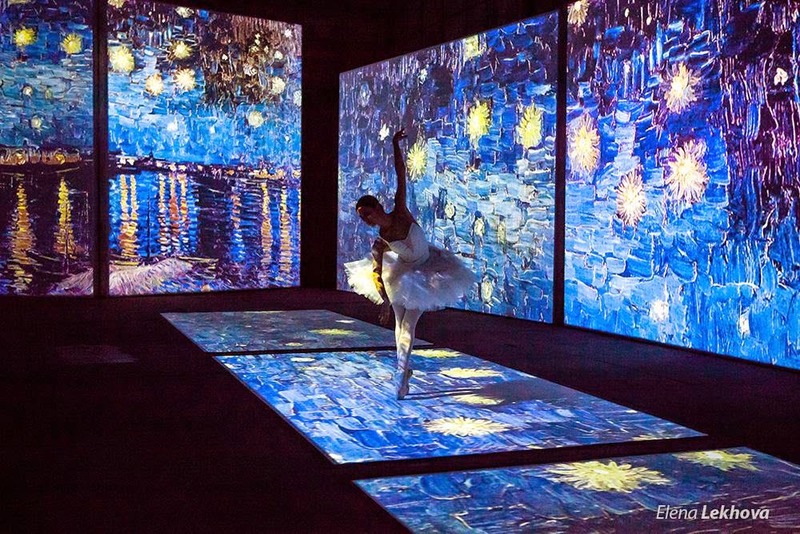 Recently I was astonished by a Van Gogh exhibition in Russia, where with a very talented ballerina and some projections the organizers achieved to offer visitors a spectacular multisensory experience. First, I thought that they displayed big pictures with parts from the paintings but with a little bit of research and curiosity I found out that what they used is a technology called SENSORY4. Now you may wonder how does it work. Well, the SENSORY4 exhibition experience innovates beyond traditional forms of engaging an audience; it uses sound and video in a whole new media format. It is driven by a suite of powerful computers, a bespoke software system that controls up to 40 high definition projectors and a digital surround sound system using 10km of cabling. And this is not all! Regarded as one of the most exciting multi-projection systems in the world, the SENSORY4 system projects huge crystal clear images onto an array of screen geometry configured to the given space. This discovery changed completely my traditional thinking about art exhibitions. For me art had to be original, it had to made me feel the touch of the artist´s hand, mind and spirit on the painting that was displayed in front of my eyes in order to be able to perceive it as alive. So, technology didn´t have it´s place in my little bubble world. But after seeing Vang Gogh Alive exhibitions I had a revelation: living in a digital world, art has the possibility to travel through technology. It is no longer limited, it is there and it is more alive than ever. It is upgraded to another level as ArtTech (how I like to call it), moving around the world for everyone to see it, feel it, hear it and touch it. Nowadays, people are seeking more and more for unique experiences, for something that will stop them for a second from their rocketing life pursuit and take them in a journey of discovery. I believe that through a technology like SENSORY4 or even a similar one museums can become more entertaining and educative than ever. And if we are extending more our minds and creativity, businesses can be more successful and places more visited. If after reading this I made you a little bit more curious you can have a look on: http://www.grandeexhibitions.com/traveling-exhibitions/van-gogh-alive/ .